Due to its location and history, Grenada boasts a flavourful cuisine which has been influenced by African, French, British and West Indian cultures. Traditional recipes reveal a world of zesty and aromatic dishes which are perfectly seasoned with locally-grown herbs and spices. 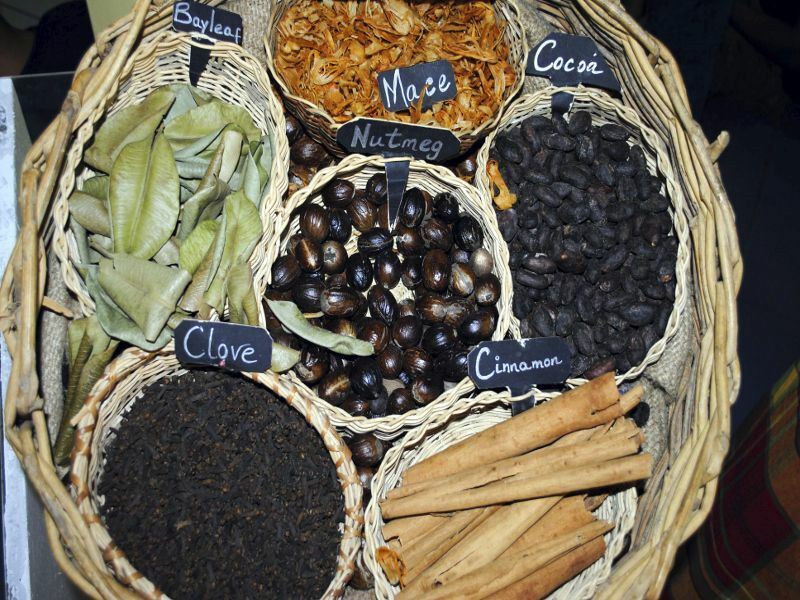 Often called the ‘Isle of Spice’, Grenada produces a large quantity of the world’s cinnamon, nutmeg, allspice, cloves and ginger which feature prominently throughout the island’s gastronomy. Many recipes take advantage of the readily available fresh herbs, spices, fruits and vegetables, as well as the great variety of fish and meat, to create simple dishes which are always sure to please. Pineapples, bananas, mangoes and papayas are commonly used for making all sorts of desserts, drinks and salads, while coconuts are incorporated into a wide array of both sweet and savoury dishes. Popular vegetables include onions, potatoes, sweet potatoes, carrots and cassava. Rice is a basic staple and is often served alongside lentils, lima beans, black-eyed peas or kidney beans in main courses. The plethora of spices available on the island means that almost every single true Grenadian dish incorporates at least one of the fragrant seasonings. Fresh fish and meat can also be found in most recipes and often come in the form of goat meat, beef, chicken and pork. Callaloo is a delicious vegetable which is widely available throughout the whole of Grenada. Because it looks remarkably like rhubarb, you might be very surprised if you bite into it without knowing exactly what it is. The long and leafy vegetable is hard to describe – it tastes like spinach, but a rather sweet and pleasing kind of spinach. In callaloo soup, the spinach-like vegetable is blended alongside leaves from the dasheen plant, as well as coconut milk and spices to create a mild and palate-pleasing starter. The national and most popular dish of Grenada, Oil Down is a must-try during your visit to the island. A hearty stew made of salted meat, a medley of vegetables, coconut milk and spices, Oil Down might sound like a bit too much to handle, but the flavours and textures work incredibly well together, creating a dish unlike any other. Breadfruit is the star of the recipe and is often tough to get a hold of anywhere but the Caribbean. The fruit got its unusual name because when it’s eaten before it has ripened, it has a taste and texture which is very similar to bread. The stew is boiled in one pot until all the coconut milk has been absorbed and the mixture has taken on an oil-like texture. The best way to savour an authentic Oil Down is to head to a local cook up where neighbours, friends and family get together to prepare a delicious meal and then eat it. You can also order Oil Down at plenty of restaurants, or if you’re feeling adventurous, take a look at the recipe at the bottom of this article and make it yourself at home. Thanks to its Caribbean location, you can’t go into many restaurants in Grenada without seeing jerk chicken on the menu. Very similar to the popular Jamaican dish, jerk chicken in Grenada is often made using chicken wings which are marinated in a combination of locally-produced spices. To make the one-of-a-kind marinade you’ll need to mix chopped onions together with minced garlic, nutmeg, thyme, cinnamon, allspice, jalapeño peppers, soy sauce, cracked black pepper and olive oil. The chicken wings are left to marinate for at least one hour, although if you’ve got the time its best to leave them overnight, before roasting them in the oven for 30 minutes and serving. When you think of roast pork you probably imagine a traditional British Sunday lunch with all the trimmings, however roast pork in the Caribbean is totally different. In Grenada this dish uses pork tenderloins which are dry-rubbed with a wonderful blend of spices which give the pork its unique taste. Chopped shallots are combined with a handful of bay leaves, a pinch of salt, a sprinkling of allspice, a dash of ginger and a generous amount of pepper which is rubbed all over the meat prior to cooking. Whilst this combination of flavours already sounds appealing, the sauce is by far the most appetising part of the dish. Made from fresh orange juice, brown sugar, minced shallots, bay leaves, fresh ginger and allspice, this delicate sauce is poured over the pork and served up alongside a black bean and corn salad. Even though it sounds quite alarming and bizarre, turtle toes is a delicacy too good to miss out on. This dish is made up of ground lobster and conch which are pressed together and shaped into little round balls before being deep-fried. The balls are then placed back into the lobster shells and arranged dramatically on a large plate. The large quantity of quality spices grown on the island means that nutmeg regularly appears in the local cuisine, especially when it comes to desserts. Homemade nutmeg ice cream is one of the most delicious treats available on the island and is the perfect way to end a meal. The ice cream is made the traditional way, using eggs, cream and milk but the secret ingredient that really makes the dish is freshly-grated nutmeg. You can buy nutmeg ice cream from a number of establishments all over Grenada, including shops, restaurants, beach-side kiosks and even ladies in the street who sit under the shade of umbrellas next to ice cream making machines. Throughout Europe, sweet potatoes are mainly baked, fried, roasted or mashed and served up as a side dish to a savoury main meal. However, in Grenada they’re often prepared in a very different way and enjoyed as a healthy dessert called sweet potato pudding. To make this popular pudding, you’ll need to peel the sweet potatoes, boil them and mash them, just like if you were making mashed potato. After this you mix the potato with coconut milk and flavour it with allspice, nutmeg, cinnamon and even more coconut. Some people throw some apples into the mix, too. The pudding is baked in the oven for up to two hours and is served with a scoop of ice cream or a dollop of whipped cream, all topped with a sprinkling of crushed biscuits. Found on Lagoon Road, opposite the Louis Marina, Patrick’s Local Home Style Restaurant is the best place to go if you’ve got a large appetite. Here you’ll find a huge selection of meals to choose from here – all of which come in overly generous-sized portions – so there’s bound to be something for everyone to enjoy. If you can’t settle on just one dish, consider ordering the tapas-style feast to share. Made up of 15-20 different local dishes, this banquet gives you the chance to try a little bit of everything and really get to know Grenadian food. Owner Karen has done a fantastic job of creating a casual atmosphere which makes you feel like you’re enjoying an authentic home-cooked meal in a local’s home. Another popular restaurant which is a must-visit is Rhodes Restaurant at the Calabash Hotel. Owned by the celebrity TV chef Gary Rhodes, this elegant eatery offers guests a vast array of dining options, with each recipe having been inspired by the plethora of ingredients available from Grenada’s fertile and lush soil. Gary Rhodes has worked hard to craft a world-class menu which includes many tempting dishes, such as crispy pork fritters, grilled snapper fillet and chocolate banana pudding. Not only is this restaurant a treat for the taste buds, but it’s also a great place to watch some live entertainment, which ranges from local steel pan bands to classical concert pianists. During the biggest and most important celebrations in Grenada – Christmas, Easter, Corpus Christi, Emancipation Day and Thanksgiving being just a few examples – the locals get together for a cook up. During this time everyone pitches in to help prepare huge meals which feed the whole village. Oil Down is regularly prepared for big events because it’s relatively simple to make and needs very little attention when cooking. The boiling process can take up to several hours, during which everyone involved has plenty of time to drink, dance and generally enjoy the laid-back, friendly atmosphere. The International Food and Drink Festival takes place in March in Grenada and provides visitors with a wonderful opportunity to sample the wealth of local dishes available throughout the island. The Spice Jazz festival is also a popular foodie event and incorporates music, art, crafts and local foods in one grand event which pretty much sums up the Grenadian culture. Oil Down is the national dish of Grenada and is very popular in local restaurants. This hearty one-pot dish is very simple to whip up and is made of meat and vegetables stewed in coconut milk, herbs and spices. If you struggle to get a hold of some of the more exotic ingredients in your local supermarket, try searching online. This dish takes 15 minutes to prepare, 45 minutes to cook and makes enough to feed three to four people. You’ll know the dish is done when most of the liquid has been absorbed and the breadfruit looks soft and almost mushy. If you think the dish is too dry, feel free to add more coconut milk, although there should be no liquid left in the bottom of the saucepan. Taste the dish before serving and add more salt and pepper to taste – salt is probably not necessary since the salted meat is the main flavour of the dish. Article written by Nicola Quinn.